Every handsome man deserves a distinct accessory, and JustMensRings.com may have just the solution you need. 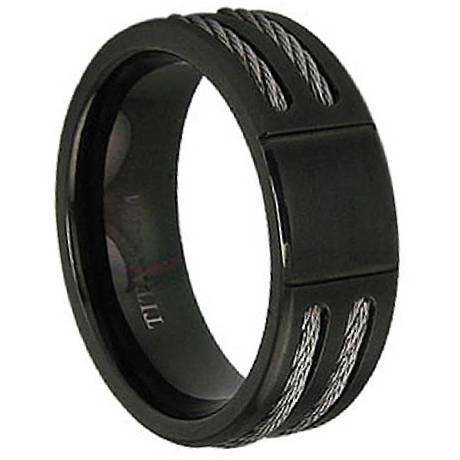 Our black titanium cable ring exudes masculinity and will become your go-to fashion accessory for every occasion. Titanium is quickly growing in popularity because it is much more affordable than precious metals. Plus, titanium is resistant to corrosion, denting, discoloration, and tarnishing. This resilient material provides a welcome solution for men who prefer monochrome jewelry. 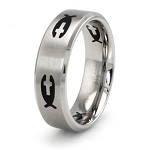 Each men’s black titanium cable ring features a glossy black finish that looks sleek and sophisticated in any light. Add some pep to your step by choosing this ring as an everyday accessory. We offer a wide range of sizes, so you’re guaranteed to find the perfect fit. What sets our black titanium cable ring apart from the rest is the meticulous craftsmanship and attention to detail. We incorporated two rows of silvery cable to provide a bit of bad-boy edge for all you daredevils and rulebreakers. 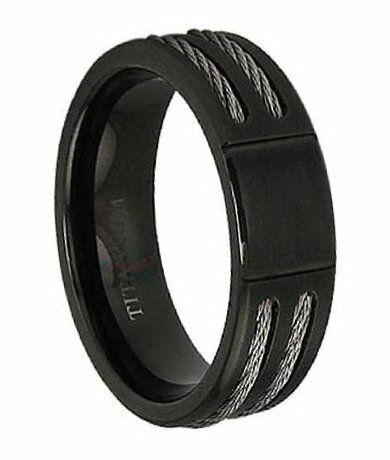 Some of our customers choose the men’s black titanium cable ring to serve as their wedding bands. Black wedding bands are not at all uncommon anymore, and the two-toned look of this ring allows you to wear it with any kind of wardrobe. This designer ring features a comfort-fit design, which is great for men with large knuckles. We recommend that you have your finger sized for accuracy by a professional jeweler because comfort-fit rings tend to measure a half size smaller than traditional rings. If you have any questions, please contact us today to speak with a representative. My partner and I love these rings. They look good on us and are a great engagement band. I decided on this as I was surprising him with the proposal and did not want to send too much on a ring he did not like. Well he likes this ring and we may use them as our wedding bands. They match our style and are comfortable. I ordered this ring for my fiancé's wedding ring. I was more then happy when I received it in the mail. The picture doesn't do it justice. Thank you for such prompt shipment, great customer service, and a beautiful ring. I live in the uk and bought this ring for 30 dollars, which converted to less than 20 pounds, bargain! The ring does not come gift boxed, but that can be expected for the price. It was however wrapped in bubble wrap and inside a padded envelope so reached me in good condition. Ring arrived within the estimated 21 days for international shipping, which indeed felt like ages to wait, but can not be helped with international shipping and is something the ring company have no control over. Also the postage was free, compared to another us site that wanted me to pay 40 dollars to send to uk! The ring was the size stated, with the us sizes converting to a half size in uk sizes. My other half was very happy with the ring as he works with cables so liked the cable design running through it. Have to say very happy with purchase. Was very pleased when it arrived. Looked way better than the picture. Looks great when its on his hand. Would definitely recommend this ring!! My husband is not much of a jewelry guy but loves this ring! Thank you for the many selections.